Hey loves, hope you’re all doing well! With Fall finally here, everyone is starting to get into the “cocoon” mode. For many, that means staying at home watching baseball or football, or whichever sport is in season right now. I've never been big on baseball , however a lot of my friends have been raving about the Blue Jays, alongside the rest of Canada I believe. We went out to eat the other night and watch the game, so I thought I'd chime in to show my support the best way I know how, with a sport inspired OOTN. 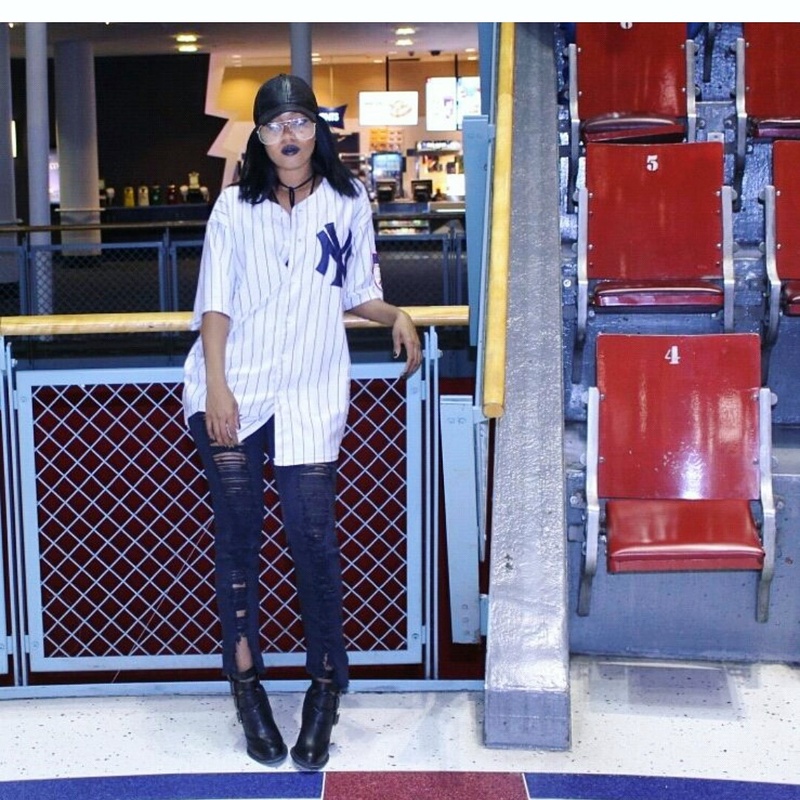 For this look, I borrowed my boyfriend's limited edition Babe Ruth jersey. I know, I'm shocked also that he actually agreed to let me wear it. Let me start by saying that this was was one those outfits I tossed together last minute, not knowing how it would turn out, but I'm so happy with the end result. This dress for me was one of the items you purchase think "one day imma rock this" but never can find the right time, or confidence in my case, to make the piece work. If you're part of the itty bitty committee like I am, then a plunging dress like this one from Sirens, might give you a scare. Rumor has it that it's easier for us small boobies gals to wear deep cut tops and dresses because we don't have to worry about support. While support may not be an issue for most of us in this club, we still have our own set of concerns to deal with. For one, going g bra-less isn't always option, especially since most us aren't model thin and can pull off the "flat chest and killing it" look. A Wonderbra for example adds proportion to the body. Finding a bra that is both padded and invisible is a task. My go to is the Victoria Secret Bombshell bra with an adjustable front clip. This allows you to widen the front to make the bra invincible for plunging dresses like this. Another common issue is the bust area being too big, therefore always having tailor the dress to get the perfect fit. I opt for dresses with a wired bust line. This aids in offering more support and keep the top from bulging out. My mission for the weekend was to have fun, relax and unwind. After a hectic workweek, starting a new job and adjusting to a new work environment and schedule, I just needed a mental break. I called up a friend on Saturday and he suggested going to the gay village to stroll and grab lunch. It was a perfect idea because I couldn't recall the last time I had been to the gay village. I almost forgot all the cool sightings and the unique atmosphere it offers. BACK TO BASIC: Tips to finding your pair of bombshell jeans! The next coming days are going to be the last for us to bare legs in shorts, dresses and skirt. I'm pretty excited for fall, however, with fall pretty much on the way that means pants season has arrived. It's also back to school season, so pretty much back to the basics of jeans and a tee; all day, everyday. For me, like for most of us, shopping for a pair of great fitting jeans is a huge task. I've gotten buyer's remorse countless of times after spending hundreds on jeans I thought were amazing in store but didn't fit so well at home. Through trial and error I've come up with a few guidelines I follow whenever I'm shopping for jeans. I'm sure they'll be useful to you also.